Planning the perfect summer has never been easier. 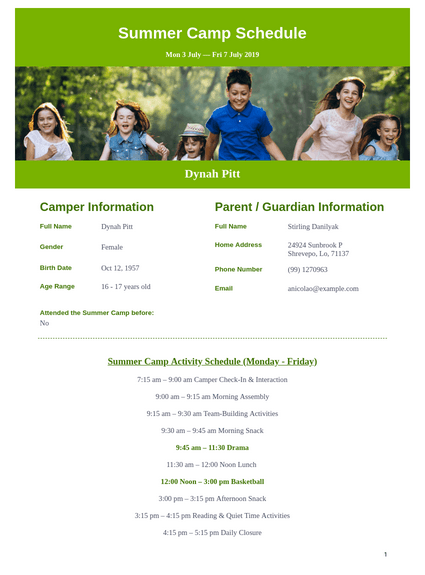 JotForm’s Summer Camp Schedule PDF Template instantly converts all camper schedules into easily accessible PDFs, so you’ll never lose track of which activities each camper is participating in. With JotForm’s PDF Editor, you can customize the template by changing the background image, adding your camp’s logo, and including your program’s itinerary. You can easily print these PDF schedules to hand out during the first day of camp, or you can set up an autoresponder to instantly email campers their schedules. No more organizing every individual schedule by hand! With the time you save, you can plan even more exciting activities for the kids this summer.